So easy even my boyfriend could do it! Marley Spoon is a new company on the block, which looks to inspire people to cook more adventurously. They offer a unique service, delivering ingredients and tried and tested recipes right to your door. The chefs at Marley Soon create dishes in their kitchens everyday. These ideas are used to develop unique weekly menus from which you can choose the dishes you want to try out. The parcel you receive will have all of the ingredients you need to cook your meal, except for a few store-cupboard basics like oil, salt and pepper, vinegar etc. Some of the items come through whole, like vegetables or pots of sauce and others, like herbs and spices, are measured out into the amounts you will need to use. The food comes along with a very easy-to-use step-by-step guide to help you through the whole cooking process. Marley Spoon has some great core company values including a stern dedication to sustainability. They use paper-based tapes, reusable cooling pads and regenerative sheep’s wool as insulation. They also offer a returns service, included in the price, in case you don’t have easy access to recycling services – great if you’re like me and live in a flat where they don’t collect. They also build relationships with sustainable suppliers in order to deliver value and best practice across the chain, not just be a retail outlet – we love this ethos at Tasting Britain! We tried out two of Marley Spoon’s recipes – creamy parmesan and aubergine bake, served with basil gnocchi and Chiang Mai curried pork noodles. Both of the recipes were straight forward and easy to follow. Broken into 6 steps, the instructions weren’t as daunting as many other recipes, but this didn’t result in a lack of flavour! Each card will tell you what you get in the pack, what you will require additionally, how long it would take to cook and how many calories each meal contains. I’m not a fan of rocket so left this out of my pasta dish and instead used the vinaigrette to add some further flavour to the gnocchi, which worked really well. This is another advantage to these meals, although they are convenient, they aren’t ready meals so you can adapt as you go along and tweak to your own taste preferences. The cost per person per meal is by no means insignificant, with meals averaging between £9-£11 each, which on first thought to me sounded very over-priced. However, weigh up exactly what you are getting for this … top-quality, fresh ingredients, many of which have been measured ready to use; well-planned instruction sheets and a cooking hotline (open four evenings a week) for if you need some help; recyclable packaging and a service to send it back; delivery right to your door. Add all of this together and £20 for two people seems fairly reasonable in my opinion, and something I would like to do every now and then as a treat for me and my partner; after all, this isn’t just a package of food but a whole cooking experience. What can I get from Marley Spoon? The menu changes every week as the team look to source new ingredients and try out new recipes. As Valentine’s Day is coming up though, the team are offering a special menu for the occasion! Why not avoid the crowds and terrible service awaiting you in restaurants on the 14th and try out a special meal at home? The Valentine’s menu starts at £18 per person (delivered) and can be delivered on 11th or 14th February. 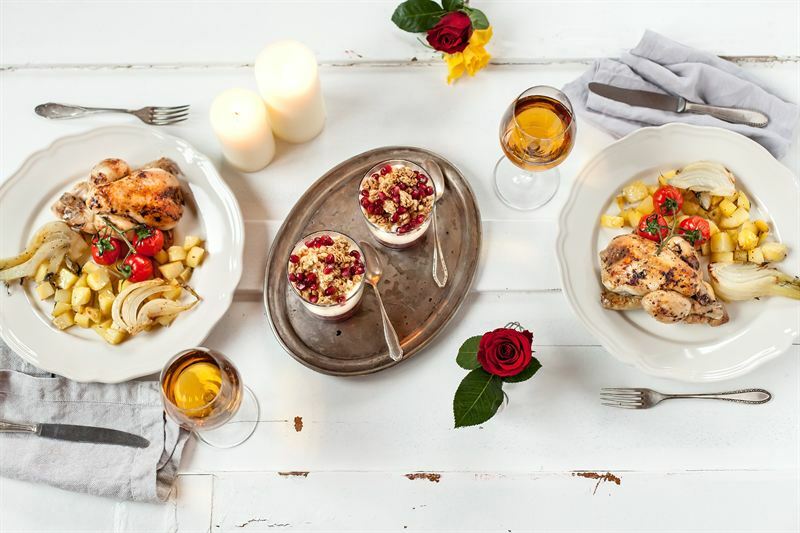 Simply grab a bottle of wine and have a giggle making your own romantic feast.